I first discovered Corpse Party on Youtube when one of my favorite Let’s Players (Cryaotic) decided to do a walkthrough of the game. 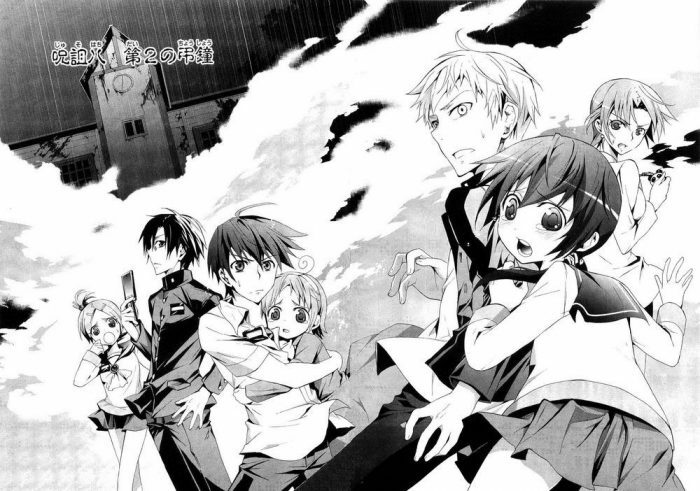 Yes this a manga review, but the story of Corpse Party goes way back to 1996. Initially beginning as a horror-survival game developed by Team GrisGris on RPG Maker, receiving a remake named ‘Corpse Party: Blood Covered’ in 2008, which was followed up by numerous sequels including ‘Corpse Party: Book of Shadows’ for more up-to-date gaming platforms. 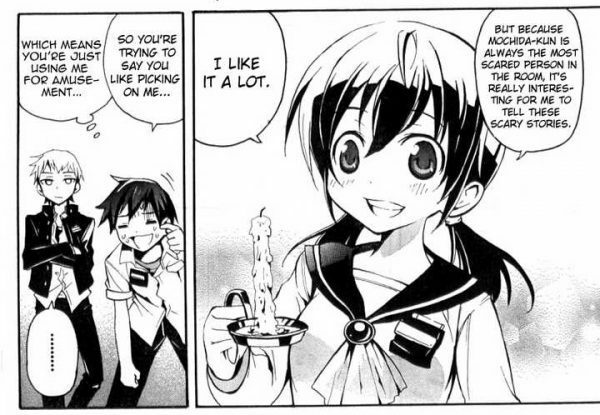 It is the Blood Covered remake which this manga is based upon. 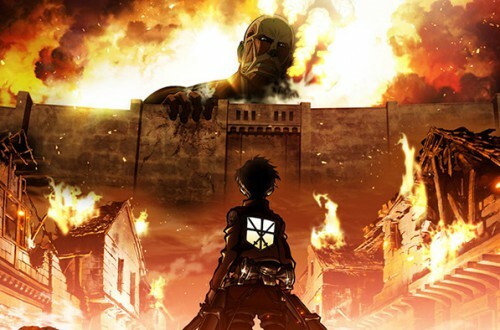 The gameplay itself is unique for games released in the west as it is a horror game that blended the genres of RPG and anime-style visual novel to great effect. The game is tailored to the choices you make which, means making the wrong choices usually get characters killed. Thank God for multiple save slots. The plot utilises elements found in both Eastern and Western horror movies. Numerous elements from the story, to the character profiles and even the soundtrack all pay homage to B-movie classics and the likes of John Carpenter’s Halloween and Ju-On: The Grudge. Our story begins with an introduction to our protagonists, Japanese high school students (of course), telling ghost stories as they tidy up after a long day of putting on their school’s Culture Festival. Saddened by the news that one of their friends will be transferring to another school, they decide to perform “Sachiko’s charm”, which they found on the internet. They all gather round and tear a piece off the paper doll to perform the ritual. Suddenly, there is an earthquake, ripping the floor apart, they all fall in and wake up to find themselves separated from each other. As they explore they quickly learn that they are no longer in their own school. They have somehow found themselves in the strange dark, decimated corridors of Tenjin (Heavenly Host) Elementary School. A school that was ripped down and rebuilt decades before due to its long running history of unexplained kidnappings. They must find a way to reunite with their friends and get back home before they are consumed by the looming darkness and blood-thirsty child spirits that stalk their every step. 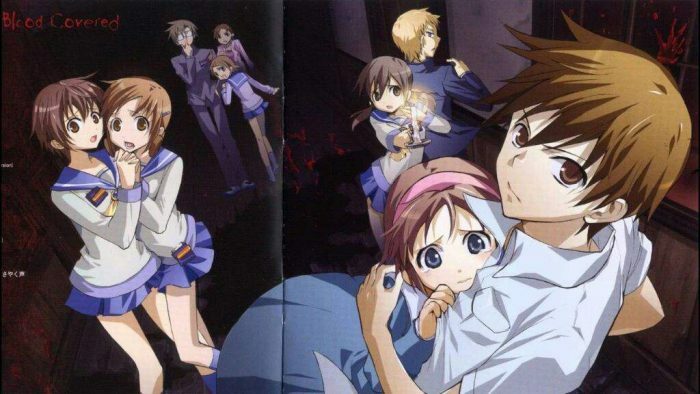 It doesn’t take long to find out why this is a “Corpse Party”. Sounds intriguing doesn’t it? So when I found out there was a manga I leaped at the chance to read it. Of course, with all adaptations of existing works, there will be changes to accommodate to the platform the story is told form. Example, in the game, you have the advantage of top notch Japanese voice acting and sound effects to really flesh out the mood and tone of the story. The manga compensates for the lack of these elements with striking graphic imagery, typography and a broader range of facial expressions. The tone of the story keeps you in suspense. One moment, the characters are happily chatting and encouraging one another and share some genuinely funny and moving moments (with a safe sprinkling of comedic fanservice.) Scenes that make the characters relatable and drive the reader’s desire to see them succeed. The next moment, they are either making disturbing discoveries and advancing the plot or fleeing for their lives. All the while you are gripping the pages, praying to God your favorite character makes it out alive. As it is established early on that major characters can and will die. To me, it felt like a good break in the tension so that when horrible things do happen, it has a harder impact. In the tradition of horror movies, you are given a cast of characters, usually based off whatever stereotypes are popular at the time. E.g. The Hero, The Jock, The Nerd, etc. Here they use anime stereotypes. E.g. 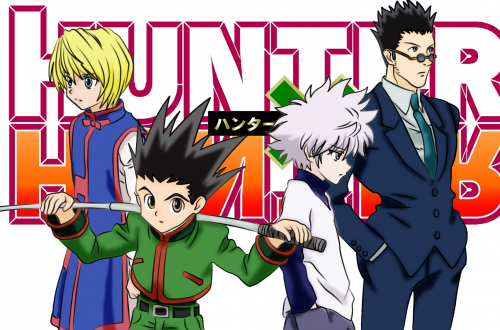 The Average Male Protagonist, The Kid-Sister, The Love Interest, The BFF, The Delinquent, etc. It is interesting to watch these stereotypes grow and develop throughout the story. In order to survive they are driven to doing things they never believed they would do and they carry that responsibility with them thereafter. Leading to some of the most emotional parts of the story. 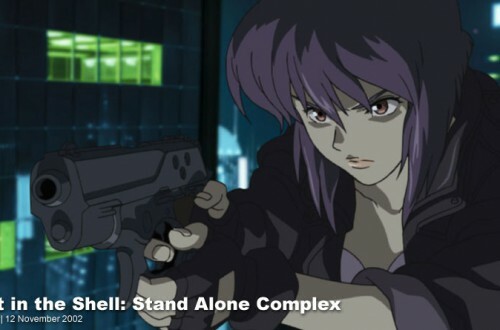 Especially in regards to characters like Seiko and Kishinuma. I found myself rooting for these two more than any other character because they had the most complex backstories and motivations. Not to mention they often found themselves carrying the weight of the so-called heroes of this story. But every tragic tale has its fair share of villains. 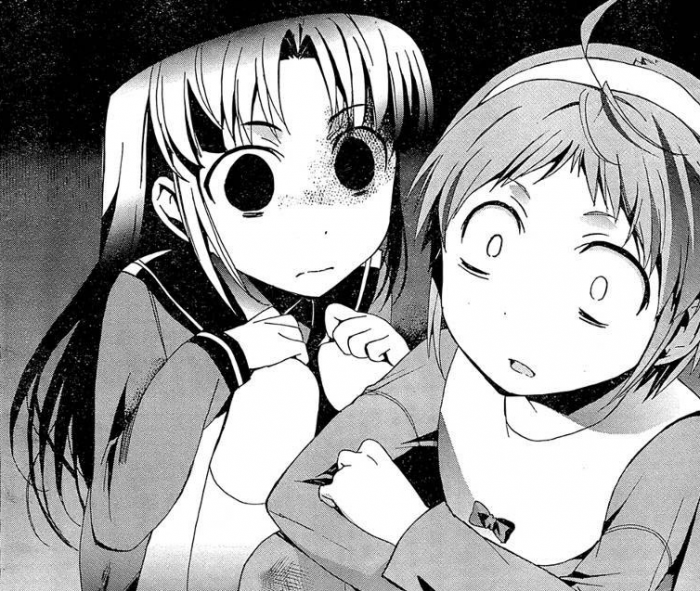 Again, you think you know who the real monsters are until the heroes start encountering other victims of Sachiko’s curse trapped inside the school. Not only do they have to contend with other survivors and malevolent spirits, but will their sanity hold out long enough to get back home? Overall, I would recommend this to anyone who loves a survivalist ghost story, crammed with mystery solving, dead bodies, graphic violence, goopy gore and teenagers falling in love, running away from small spooky children and a huge hulking guy wielding a sledgehammer. It’s just bloody good fun, not to be taken too seriously. A lot like any B-movie horror flick. Just enjoy it for what it.